Spider-Man and his Amazing Friends zip across NYC’s skyline in pursuit of evildoers! 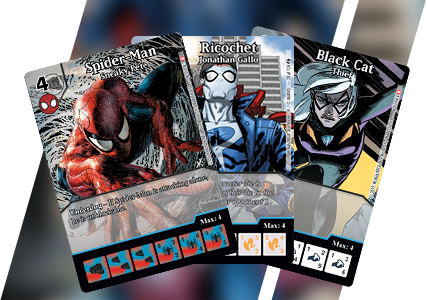 They sling webs, sneak past defenses, stop evil – and again they’re doing it on the tabletop with the Marvel Dice Masters: City Slingers Monthly OP Kit! In the Marvel Dice Masters: City Slingers Monthly OP Kit players face off in tournament play at their FLGS for the chance to win exclusive prizes. As a participating store in the program, you will need to register your store in the WizKids Info Network (“WIN”). If you haven’t already registered your store, please make sure you visit the WizKids Info Network and click “Create New STORE Account.” If you have any questions or problems, contact wes@wizkids.com and put “WizKids Info Network” in the subject line. Once your store is registered in the WIN, you can schedule your Marvel Dice Masters: City Slingers Monthly OP event using the official template in the “create an event” section of the site! As a participating store in the program, you will register your store and your events in our database using a simple browser-based interface. The information you provide will populate our event locator that will direct visitors of www.DiceMasters.com to your store to participate in the Marvel Dice Masters events. The Marvel Dice Masters: City Slingers Monthly OP expands on the Dice Masters Organized Play event series based on the Marvel Universe. Stores interested in participating should contact their Dice Masters distributor today! Players interested in participating can find stores and events in their area through the WizKids Info Network!